This challenge was to make a card using fabric, cotton, flocking and the sort. I chose this really cute little image. I love this set! I love stamps that make me smile; I enjoy every minute I'm using them just giggling and smiling like I was in grade school again. Okay, I've said it, it doesn't take much for me. If it's cute or whimsical I usually love it. I believe the set is called "Nikki and Friends"...I'm sorry, I can't remember and it is not listed anywhere. The whole set of three are just adorable. After stamping and coloring with Copics, I added tiny little cotton balls for the snowballs and Stardust Stickles for the snow drifts and on the lake. Don't they look cute just waiting for a skater to come by and whopp 'em one??? Look at the mischieveousness on that face. 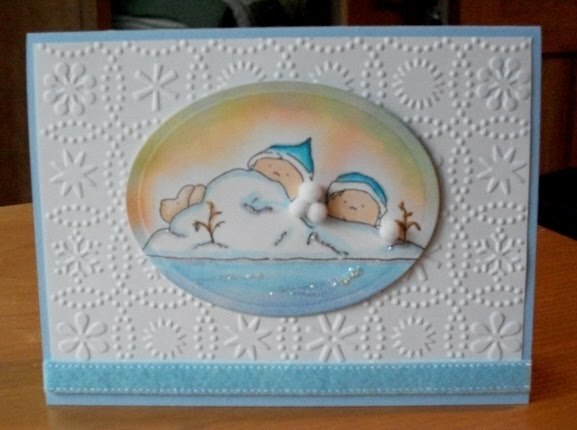 The base card is Bashful Blue with a white panel embossed with Snow Dots EF. There's a piece of light blue Martha Stewart self adhesive felt borders on the bottom. The main image was cut out using an oval Nestability and embossed. Hope you like it. It was a very fun card to make. Misc: Mini cotton balls, StarDust Stickles, Copics, various SU inks for sponging sky, Snow Dots EF, Oval Nestability.